On July 9, Prince Louis was baptised at St. James's Palace's Royal Chapel. 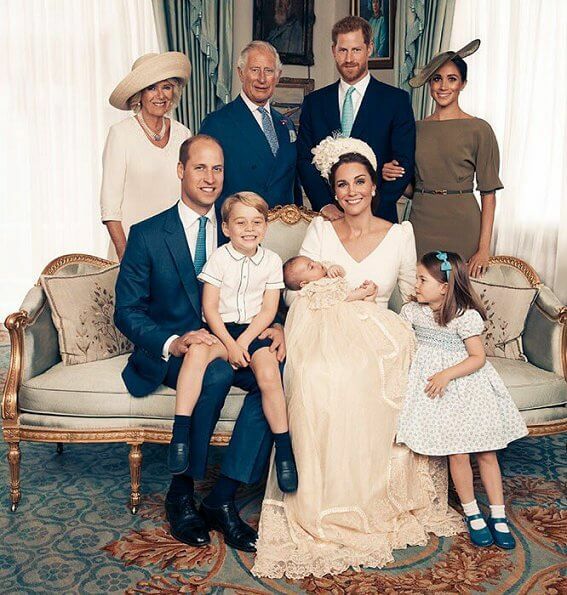 On July 15, The Duke and Duchess of Cambridge have released five official photographs to mark the christening of Prince Louis. 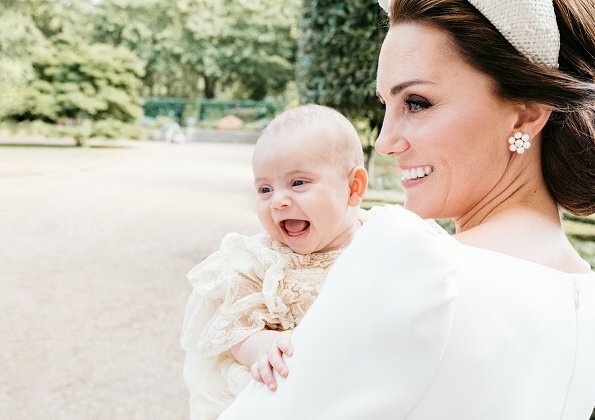 The photographs were taken by Matt Holyoak at Clarence House, following Prince Louis's baptism in Chapel Royal, St. James’s Palace. These photos are so beautiful, you can just feel the love and happiness radiating. I may be one of the unpopular few, but it just bothers me that Meghan feels the need to latch on to Harry. She looks so much more sure of herself and regal in the first picture, where she’s holding her own. I guess V Burks and Anonymous is the same person ? Agree about Meghan, makes her look needy! Completely agree with you Anon 4.43 and V Burks. You are not alone. I agree!! Its nice sometimes but not here. What a nice surprise the photos are out. Very nice each and everyone of them. Very happy people,just like it should be. I like the one with Kate and Louis alone and the other with William and the kids and Kate off course. Thank you for posting them. The only things wrong are Harry's tacky aqua tie, and Kate's headdress blending into her Mother's outfit behind her. Oh, and Charles's creepy smile. Isa, what do you mean with Charles "creepy smile"? agreed as far as Catherine's tacky headpiece. I don't mind the tie as much, it plays to the blue colour scheme. I actually have another question. I don't know if it's just me or something is wrong with the resolution of these photos. Some of them seems bizarrely blurry, as if the photographer had a camera of low quality...? Tess, I agree with the odd colorization of the photos. The color has been altered to make it look more 'antique' appearing. To see the dress Meghan was wearing was a lovely shade of olive green. In the photos posted above, the color has been altered to the point of making her dress almost appear as if it was taupe. The photos were darkened for some reason. Why are kate's brother and sister in the photo ;and no photo of the god parents.Prince Harry and Meghan are members of the Royal family. We didn't see Princess Diana's sisters in christening photo's. Catherine and William wanted family photo with both families, there is nothing wrong in that. There was sure also photo with godparents, but it is not put to these pictures. And Harry is not a brother too? William's brother? Why shouldn't Kate's brother and sister be in a Family photo? 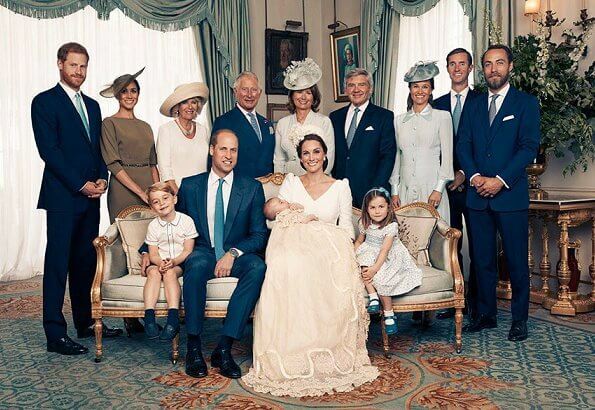 No photos of the Godparents were released for George or Charlotte. Catherine and William do not publicize the Godparents other than announcing their names. meghan looks very very chic wow!!!!!!!!!!!!!!!!!!!!!!!!!!!!!!! Lovely pictures - adore the first one with Catherine and Louis. What a nice family day. The extra new pic; Catherine and Louis is so cool, best ever! It looks like this is another post you should delete. You really think Meghan was supposed to dress in blue? If that is the case, I think you should call out the godparents as well. People don´t make us angry, how we think makes us angry. When we understand the needs that motivate our own and others behavior then we have no enemies. wat een schattige foto,s wat een leuke familie !!! Meghan and Harry are still on honeymoon folks. Must we find something negative to say. Thank you, Unknown! Leave Meghan be! Good grief, if linking your arm through your new husband's is awful, what can possibly be right about anything in this world? It's a charming gesture that hurts no one! Thank you Unknown and Pine! It is so refreshing to see some actual affection shown in the BRF. They do have a very stuffy reputation. Diana made it alright to be a hands-on mom and show public affection for royal children, and I hope Harry and Meghan have started to thaw out some of the old ways for royal couples. I agree. It's just about time that someone can and dares to hold their spouse's hand in BRF. Why not? It's not impolite at all in my opinion. Many other royal couples are often seen holding hands for example CP Victoria and Daniel, CP Mary and Fredrik. It doesn't make them less royal or regal just more human. Beautiful images. Kate is glowing. And wow, how beautiful is baby Louis. Lovely photos and lovely family. Only snag, is DoS holding onto Harry, whilst standing still. Looks a little off. That said, she looks lovely, not many people could wear that color. The latest photo of Kate and little Louis,laughing is very precious, we did not see this with the other two children. I like all the photos. Me too, I also like all the photos. Especially Charlotte on photo nr. 5! Lovely Mehgan. She is just perfect. It bothered me when I saw the original photos and TV footage? Why does Prince Harry look so sombre? Normally he's grinning and looks really happy but in both of the photos in which he appears, he's hardly smiling at all. I've noticed that too. Lately he seems so serious and kind of aloof. He's kind of losing his fun loving side. My favorite photos of the baptism of little Louis are #1 4 5 the other two are very very nice too,but there is something about #1 and 4,the alertness of the boy and the big smile are fantastic. It is sweetness overload. Sorry! It didn’t let me post and then it ended up going three times. No shame, still stand by my opinion! 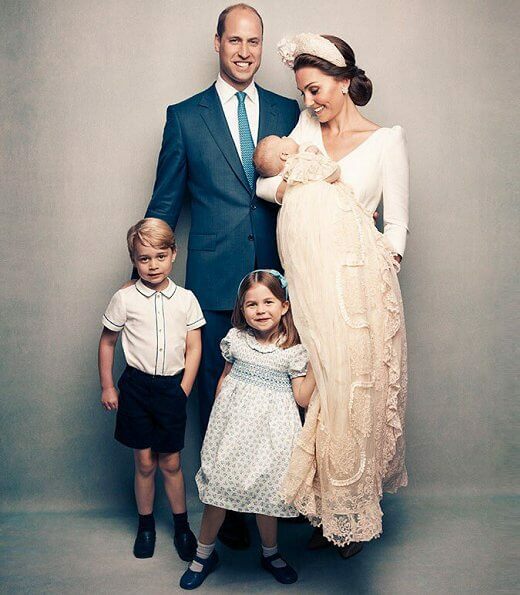 Gorgeous photos; P. Catherine looks so beautiful... loving, adoring, mother...love her ‘hat/piece’! Blessings to family. Fully agree with you Terri. Lovely photos! The smiles say it all. Getting use to Meghan's style - I favor pastel colors in Summer, but she does her own thing. My only advice to her would be to continue with well-groomed hair. Her hair is a lovely color, and the messy bun thing doesn't photograph well. Ein entzückenden kleiner Louis in den Armen seiner bezaubernden ,schönen und liebevollen mum ! !